Chevy is big name in the industry of the full-size trucks and one of the most respectable rivals to the top-selling Ford trucks either on the light-duty or heavy-duty front. However, it is also present in the mid-size truck class with its Colorado version which is faced with competitors from the Nissan and Toyota. 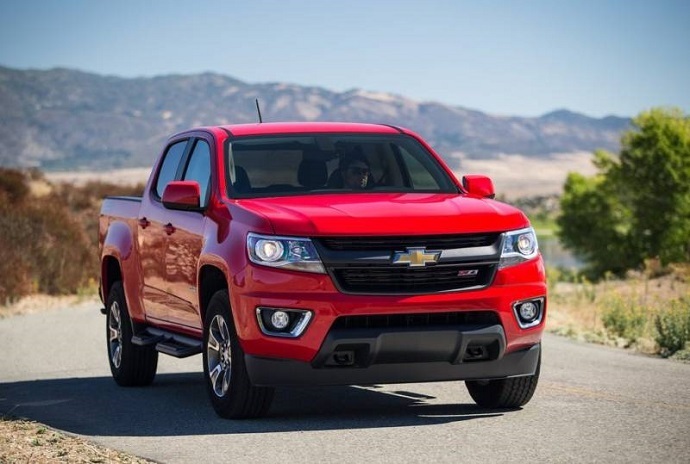 Chevy Colorado returned in the mid-size class with its counterpart GMC Canyon in 2015 after three years of absence. It came back larger in size than its previous versions but more importantly compared to its rivals it brought more modern design, better interiors and more efficient powertrains. It made another step forward for 2016 model year when the engine offer has been expanded with Duramax turbodiesel engine that is now the most efficient and capable version of this model. For this model year, the Colorado has also upgraded MyLink infotainment interface with Apple Car Play functionality. The model is now entering in the second year after its redesign and we are expecting the new 2017 Chevy Colorado to come soon. However, so far available information doesn’t promise big changes for this model but there is possibility that the company might introduce ZR2 version of this model and according to some reports it should be very close to the same name concept model that was shown in 2014. When it comes to performance, the new 2017 Chevy Colorado is expected to be powered with three familiar engines. The base engine is just base with its 200 hp and 191 lb-ft of torque that should be enough for urban speeds and duties. This 2.5 liter inline-four engine should again be available in lower trims with a six-speed manual transmission and only with two-wheel drive. A six-speed automatic will be available with both two- and four-wheel drive. Models powered with four-cylinder engine should return 21 or 22 mpg combined depending on the configuration and max towing is expected to be up to 3, 500 pounds. Much more power and torque will be available from the V-6 engine which is used in Cadillac’s CTS and ATS. This 3.6 liter displacement installed in the new Colorado should produce around 305 hp and torque of 269 lb-ft. This is significant power and torque improvement over the base four-cylinder and thanks to that max towing capacity in models with this engine will be up to 7, 000 pounds. What is also advantage of this engine, expected fuel economy will be 21 or 20 mpg combined depending on two- or four-wheel drive configuration. This engine will be paired with the six-speed auto gearbox only. The best choice will probably be last year new 2.8 liter turbodiesel four-cylinder Duramax which develops 181 hp at 3, 400 rpm and torque 369 pound-feet at 2, 000 rpm. It will be standard with six-speed auto transmission and available with either two- or four wheel drive. Its towing rating is up 7, 700 in the most capable configuration. The new Colorado will use electric steering on all models and fully boxed frame will sit underneath. The coil front suspension will also be used. As for ZR2 version, it expected to be powered with the Duramax four-cylinder like it was with the concept version but some sources also suggest that V-6 gasoline engine might be used. This model should also get beefed off-road hardware including special suspension with performance shocks and two inch lift. The styling of the new 2017 Chevy Colorado won’t introduce radical changes and considering that its design is two years old it has been expected. Some minor changes are possible but we expect more substantial for 2018 model year. However, the ZR2 version is expected to have more powerful, off-road look. This model will have reworked front fascia which will include higher front bumper’s clearance and removable bumper components. This has been done to improve approach angle for harsh off-road terrains which should measure 30.7 degrees while restyled rear bumper will raise departure angle to 22.7 degrees. This model will also ride on robust off-road tires which will provide good grip on all terrains. Inside, the Colorado will offer upscale finishes, great comfort and loads of equipment. Design of seats is good and they are comfortable even for long rides. The knee and head room are good. The model also includes nicely designed dash with well-placed controls and buttons. The center stack houses the touchscreen of the MyLink infotainment system which will offer simple many and modern capabilities like voice commands, Smartphone integration, and much more. In case of the ZR2 version, it should include some unique details like, contrasting inserts and stitching on seats, dash and door panels. The new Chevy Colorado will be offered in two cab forms and with two bed lengths. The extended Cab model will come with either two or four seating arrangement and with a 6 foot bed. More functional crew cabs with four full-size doors will be available with either a 5-foot or 6-foot beds. Details about available trims are not available but probably the same strategy will be used as on the current version with possible addition for ZR2 version. The base versions will come with vinyl upholstery, air-conditioning, rearview camera, power windows, a 16 inch wheels, a 4.2 touchscreen, locking tailgate and so on. Higher trims will bring 17-inch alloy wheels heated front seats, tilt-and-telescoping steering wheel, chrome details, automatic climate control, an 8-inch based infotainment system, On Start system, 4G LTE connectivity, etc. There will also be off-road package with all-terrain tires, special tuned suspension, the locking rear differential, unique upholstery and so on. The safety measures will include anti lock disc brakes, traction and stability control, airbags, rearview camera, and trailer sway control. There will also be available the OnStar telemtics system and forward collision alert and lane departure warning as well. The release date and price of the new 2017 Chevy Colorado haven’t been specified officially. However, this model should be expected this fall with price for the base model just above $20k. As for ZR2 version it should be priced in area around $30k.